"The only thing I don't like about this stealin' business is the hard work." "Hard work but easy pickin's." Avocados, two dollars each? Sirloin, seven bucks a pound! Who among us hasn't experienced sticker shock at the grocery store recently? Cyclic price fluctuations in the commodities sector due to weather and the growing season are normal, but sharp spikes can signal an unnatural, escalating menace to both farmers and consumers—agricultural crime. In less than a century, our country has transformed from a primarily agrarian economy to one based on industry and technology. Yet, despite seemingly endless urban expansion and the oft predicted demise of the American farmer, U.S. agricultural revenues totaled nearly $300 billion in 2007 - and the number of farms is holding steady at an estimated 2.2 million. With valuable equipment and livestock occupying vast tracks of land, often too isolated for easy surveillance, farmers are vulnerable targets for thieves, vandals, and vagrants. Today, many communities throughout the country are adapting the traditional Neighborhood Watch model to an agricultural setting in an effort to deter crime and assist investigators. To many a cityslicker, the term "agricultural crime" evokes images of Marshal Dillon chasing horse thieves from Dodge City. The truth is, however, livestock theft remains a serious, and growing, concern today, accounting for millions of dollars in annual losses to U.S. ranchers. Sadly though, rustling is just the tip of the iceberg when it comes to rural crime. A 2007 study by the Urban Institute revealed that an estimated five billion dollars is lost each year to theft of livestock, crops, farm equipment, chemicals, and pesticides as well as to vandalism and other property crimes. Nowhere in America are farmers immune, but areas with the highest rural crime rates include the Grain Belt, the state of Texas, and California, where more than 10 percent of all infractions occur. According to Danielle Rau, director of rural crime prevention at the California Farm Bureau Federation (CFBF), most reported crimes are theft related. In 2007, the CFBF reported $10.7 million in losses to farm producers in nine central California counties. In addition to food products, commonly stolen include tools, compressors, wind machines, and pumps. Typical examples: Five years ago, thieves siphoned off 400 gallons of gas after breaking into the storeroom of San Joaquin County almond Grower Kevin Fondse. In a case recounted by the LA Times, authorities recently arrested five individuals suspected of stealing $500,000 worth of agricultural chemicals with intent to resell in the border town of Calexico. Last spring, the Ventura County Sheriff's Department alerted farmers about a U-Haul truck seen casing the area prior to the theft of 2,000 pounds of avocados. decided to switch to diesel fuel after thieves repeatedly ripped off the power meter and stripped the copper wiring from the electric pump station on his property. "The first time it was hit it cost about $6,000 to repair, and the second time I didn't replace it, I put in diesel. I'm done messing with this stuff," Lara reported to the CFBF's Ag Alert in 2008. These dollar figures do not take into account residual damages. Thefts of copper wiring and aluminum pipes, also called "rips and grips," and of tools and heavy machinery waste valuable work time, interrupt operations, and lead to crop losses and higher insurance premiums--costs that are passed along to consumers. With large tracts of land miles from nowhere, farms are often the site of illegal dumping, gang crime, drug use, and other clandestine activities. Potentially the most hazardous is the fly-by-night methamphetamine laboratory. Meth lab operators set up temporary cookshops in barns and other outbuildings, or in the backs of vehicles. Before leaving, they discard chemicals, syringes, batteries, and other wastes, which pose a health hazard to people and livestock as well as pollute the environment. According to the CFBF, the burden of cleaning up abandoned methamphetamine labs usually falls on the shoulders of the property owner and can be as high as $150,000. Urban sprawl and migration from cities such as San Francisco have caught many tranquil farming communities unprepared. "We have a segment of the population used to leaving keys in the car and going about life without fences," explained Rau. "All of a sudden, new people they don't know come in, and these people see an opportunity to commit crime." Youth and gang-related crimes such as graffiti, in particular, have increased. The Ventura County Sheriff's Department has had to increase probation searches and levy both vandalism and conspiracy charges in an effort to combat taggers. "It is a constant battle," explained Captain Tim Hagel, but necessary "to put this social cancer to rest." Farmer Dave Santos of Patterson, Calif., switched his irrigation fittings to plastic after thieves stole the brass ones, which were ikely sold to a scrap yard for cash. Enough is enough! has become the California farmer's battle cry. Disgusted by ruthless acts of theft and destruction that threaten their livelihoods, the region's growers are partnering with law enforcement to form Farm Watches. Residents of Stanislaus and Merced Counties organized a Farm Watch in September 2005 after experiencing a rash of trespassing, dumping, cattle rustling, and metal theft incidents. Dubbed the Barmont Neighborhood Watch, the group uses email and the Internet to share alerts and crime prevention information to 152 members whose properties span approximately 400 square miles. Members learn to secure and mark their property, and they receive free, ready-to-post signs warning intruders that they are being watched. Individual members also are assigned a road within their Watch area to monitor for suspicious activity. When Captain Hagel organized the Ventura County Sheriff's Department Farm Watch 22 years ago, he expected no more than 20 members to join. Today, the growing network includes 350 members, who regularly share valuable crime alerts with law enforcement. For example, a West Santa Paula avocado farmer earlier this year foiled an elusive criminal with the simple click of a button. The longtime Farm Watch member snapped a cell phone photo of a suspicious individual. He then emailed the photo to authorities, who transmitted copies to beat officers throughout Santa Clara River Valley. Ventura County Deputy Tom Brown uploaded the photo and immediately began searching the Santa Paula area, where he found a pedestrian who matched the description. The mystery suspect turned out to be a convicted probationer with prior farm theft convictions. "Without Farm Watch and its quick-thinking Santa Paula member, we would have never caught the suspect," stated Deputy Hagel. City officers and deputies who swap traffic and smog for rural assignments face steep learning curves. In addition to the need to recognize livestock breeds, brand marks, farm implement types, and crop schedules, new officers must be trained to perform duties unique to the agricultural setting--say, for instance, corralling an angry 1,200-pound bull that has escaped onto the freeway. Farm Watch provides both law enforcement officers and community members various opportunities for cross-training. Member volunteers, like their Neighborhood Watch counterparts, learn how to protect their properties and to document and report suspected criminal behaviors. They also are taught to recognize the signs of a rural crime scene (e.g., discarded coffee filters soaked in alcohol, cold medicine packaging, or old batteries, or chemical odors wafting from fields or disused barns, which indicate possible methamphetamine activity). One-on-one Farm Watch training helps familiarize law enforcement officer liaisons with important community issues. During the Ventura County Sheriff's Department's Agriculture Leadership Academy, for example, Watch members and deputies get acquainted with each other and the layout of the community during ride-along patrols. State-level rural training initiatives are also available to law enforcement officers via the California Rural Crime Prevention Task Force (CRCPTF). The CRCPTF's 40-hour Rural Crime School teaches reporting, interdiction, and investigation techniques. Topics range from basic livestock theft investigation to trespass law to agricultural commodity and chemical theft, and participants further hone their skills through role-play and field exercises. After multiple incidents of metal theft at his irrigation pumps and his neighbors' in San Joaquin County, Calif., farmer Jeff Brown spent $30,000 on gates, locks and other security improvements to restrict access to his pumps along the San Joaquin River. Information technology has become one of the most powerful tools in the rural crime prevention arsenal. Email alerts and Web-based lost-and-found sites allow law enforcement officers and constituents to share photographs and information in near real time--before missing produce, metal, or livestock can be resold. 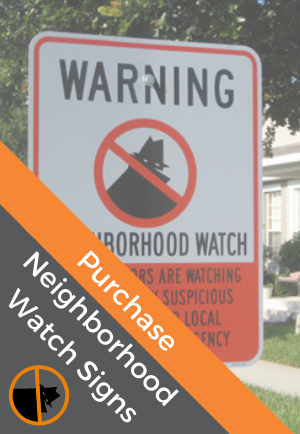 Farm Watch members warn neighbors of thefts and other crimes via posts to the Barmont Neighborhood Watch website's "Criminal Incidents" page. A Farm Watch column edited by Deputy Hagel appears weekly in the Fillmore Gazette to inform readers of the latest incidents and trends. The Stanislaus County Sheriff's Department reaches constituents via Facebook by posting crime alerts on the social networking site's agriculture-related interest groups. Several San Joaquin Valley counties have joined to form the Agricultural Crime Technology Information & Operation Network (ACTION) Project, an initiative that uses computer analysis, research and development, communications, training, and community education to combat crime. The "Stolen & Found" page of the ACTION website features descriptions and photographs of missing and stolen equipment and updates on recovered items. ACTION also works in conjunction with law enforcement to encourage farmers to label valuable property with 10-digit owner-applied numbers (OAN), which are stored in the National Crime Information Center database and can help officials trace stolen goods back to the rightful owner. "The biggest thing we tell our growers is to report rural crime," Rau stated. "Even if you don't think an incident is a big deal or you're not sure a crime was committed, report it." Disappointingly, the Urban Institute has found that only 12 percent of all infractions are reported to law enforcement. Crime rates often go down in Farm Watch communities because members are trained to take responsibility for crime prevention through vigilance, accountability, and proper reporting. Studies also show that crime rates decrease when owners take measures to protect their property. Simple practices such as securing tools and major equipment in locked barns or sheds at night, and disconnecting the ignition switch on farm vehicles after use, are proven crime deterrents. Maintaining a detailed inventory and photo log of equipment and using surveillance cameras and GPS systems can help law enforcement apprehend criminals and recover stolen goods. Almond grower Kevin Fondse eventually foiled fuel siphoners by installing a video security system and sharing suspicious recordings with investigators. Low-tech measures such as posting No Trespassing signs are also effective crime-stoppers. According to the CFBF, most rural crimes, whether crop theft or trash-dumping, begin with trespassing. The California Farm Bureau Federation, ACTION, and many local law enforcement agencies offer signs free or at nominal costs. The CFBF suggests landowners display at least three signs per mile along all exterior boundaries. In areas with large immigrant populations, bilingual English-Spanish signage is recommended. In addition to the measures described above, farm bureaus, law enforcement agencies, and Farm Watch groups have collaborated to petition local, county, and state governments to enact stiffer penalties for lawbreakers. In December 2008, CFBF-sponsored legislation went into effect requiring California recyclers to impose a three-day waiting period before paying for scrap metal, take a picture of the purchase, obtain a seller identification and fingerprint, and report the sale to law enforcement. The law also requires convicted metal thieves to pay restitution for the materials stolen and any collateral damages caused during the theft. For more than 200 years, our nation's farmers have weathered pest and plague, economic downturn, and other threats by staying attuned to market changes. As a result, our nation remains a leading producer and exporter of top-quality fruits and vegetables, meat, and dairy products. Nevertheless, agriculture crime poses a new, arguably more precarious threat today than ever before. By remaining vigilant and partnering with law enforcement, the American farmer can counter this threat and ensure a safe, varied, and affordable food supply for future generations.